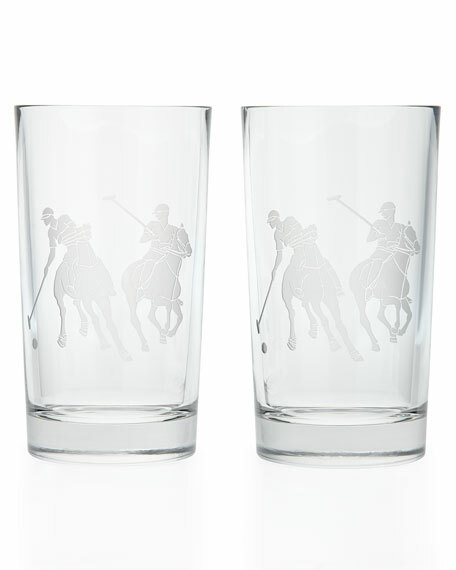 Heritage-inspired highball glasses accented with a sandblasted design of Ralph Lauren's signature polo pony. Set of two; each measures 3.25"Dia. x 6"T and holds 16 ounces. Glass highballs adorned with the Napoleonic bee. Dishwasher and microwave safe. Avoid severe thermal shocks. Set of 6. Each, 3.5"Dia. Glass highballs adorned with the Napoleonic bee. Dishwasher and microwave safe. Avoid severe thermal shocks. Set of 6. Each, 3.5"Dia. x 6.26"T; holds 15.5 ounces. Made in France. Handcrafted lead crystal decanter. 14"T. Made in France. Highball inspired by walking barefoot on the beaches and golden dunes of Truro, Cape Cod. Made of glass. Hand-painted 24-kt. Highball inspired by walking barefoot on the beaches and golden dunes of Truro, Cape Cod. Made of glass. Hand-painted 24-kt. gold accents. 2.75"Dia. x 6.5"T; holds 15 ounces. Hand wash. Imported. Handcrafted highball glass. Mouth-blown crystal. Approximately 6.625"T; holds 13.5 ounces. Hand wash with mild detergent. Imported.